Amazon offering PIGEON Baby Laundry Detergent Liquid Refill Combo, 200ml, White/Red Rs. 91 only at lowest and best price online. Free Shipping for Prime Users. Activate your prime account . You can follow the below steps to buy this product at their deal price.Keep Visiting dealsheaven.in for more Best offers ,hot online deals, promo code, coupons and discount . 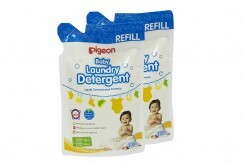 How to buy PIGEON Baby Laundry Detergent Liquid Refill Combo, 200ml, White/Red?